Bicycles are in great demand as a major labor savings device. Transporting water, people, food and other items is six times more efficient. Bamboo bikes cost less than inferior imported steel bikes. Bamboo is plentiful and does not need to be imported as a raw material. Bamboo is easy to grow and can be cultivated in dry areas with minimal irrigation. Bamboo bikes require a significant amount of labor to produce, providing skilled employment and an apprenticeship model that helps youth find opportunity. Bamboo bicycle production is not easily done in large factories. This keeps large industrialized countries from getting into the business and competing on an unfair level. 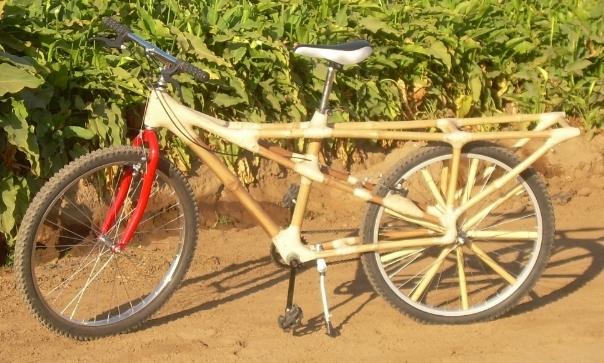 Making Bamboo bikes does not require electricity or a large investment in equipment. This entry was posted on Monday, March 15th, 2010 at 8:22 PM and is filed under Peak Cycles Bicycle Shop. You can follow any responses to this entry through the RSS 2.0 feed. You can leave a response, or trackback from your own site.